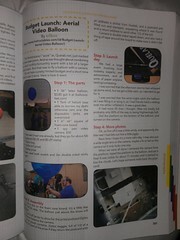 About page 301, you will find the Instructable I wrote and won Quelab 2 prizes with(even with the typos! 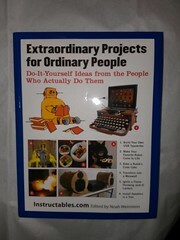 ), I’ve only skimmed the rest of the book, but its a nice tomb of neat projects to inspire! The above link is a Quelab affiliate code, so if you buy the book through there we get a few pennies! what better thing can you think of to spend your amazon.com gift cards on! btw another holiday pro tip is, there are places you can exchange your unwanted un-usable (in my case one year i got gift card for a theater chain we don’t have), for cash or an amazon gift card. (you can also buy other cards if you like to do such things) http://www.giftcardrescue.com/ is one of them. Then buy the book! I know, you are probably thinking. Well since these are all on instructables, why should i pay for them? Well I have to say while i do find cool projects on Instructables, this atleast has it curated down a bit, and even after months of hanging out in the new article rss feed, I keep seeing new things in this book i never did see online. The catch was “Do something awesome.” I was always fascinated by the old Amgia/C64 Demoscene and have always wanted to nudge something cool out of myself. Well, I did, and its kinda cool; I just finished it to a nice, polished place this morning and got a video up on youtube this morning. There’s some neat things in here: the “starfield” is really a moving graph that uses some fancy trigonometry to make pretty pictures. A touch of afterthought: The audio was overlayed by myself. I currently have some small plans to play audio on the board though. We recently received a demo board from Microchip with their new PIC-based Arduino-form-factor development board, the chipKit. While reading skimming through the technical specs, it turns out that it’s definately beyond me, hardware-wise. The chipKit has a similar form-factor to an Arduino, but it’s major difference is that it is PIC based (not AVR). Additionally, it runs at a different clock-speed and only understands the basic libraries from the Arduino suite. They do indicate that you can plug an Arduino Ethernet shield onto it and it will play ball, but some other boards might not. But that’s really OK, because they shipped us two other boards to go with it. The chipKit proto-board (a perf-board with some headers) and the Input Board (which has some switches and a small OLED screen). It looks like the perfect brains for a new project. Any ideas? Show off your grand plans in the comments and I can turn you folks loose on the board at Tuesday’s Hack Night! If you implement an awesome project, you can win the lab $5500 of tools and equipment! We’ve got a couple of months, but only the middle of January! Friends, Hackers, Nerds! Lend me your ears … or at least spare me a few moments of reading. Nikola Tesla was the father of the electric age. Despite having drop-kicked humanity into a second industrial revolution, up until recently he’s been an unsung hero in history books. If you don’t know who Tesla is, go read this (NSFW). Suffice it to say, Tesla pioneered Alternating Current, Radio communication, RADAR, Transistors, Hydroelectric power, and myirad other crazy, mad-science sorts of projects. Tesla was the Uber-Geek of the turn of the last century and he has been forgotten. A brilliant scientist and a prolific inventor, his legacy died with him after a rather nasty spat with Thomas Edison over Alternating Current tarred his name in this country. (Edison employed Tesla, failed to pay him for his work, and pilfered a number of Tesla’s original Patents… but that is a different subject). Tesla built a laboratory in Shoreham, New York called Wardenclyffe where we was going to try and perfect the projects he developed in Colorado Springs, Colorado. But due to meddling by Edison and other financial problems, the project fell through. The giant tower was dismantled, but the main buildings still stand, to this day. The Tesla Science Center of Shoreham, New York has put an offer on the property. If they succeeed in buying it, they will turn the place into a museum dedicated to the works of Nikolai Tesla: The first in the world. It will be placed on the New York register of Historic Places, and it won’t turn into another strip mall. But only if the Tesla Science Center comes up with 1.6 Million Dollars by September. But you can help. The State of New York has pledged a matching grant if the center can raise $850,000. They started a crowdfunding campaign to raise the funds, and raised half of the required funds in less than a day. (At the time of publication, the perks were all sold out below the $1000 level, but an email has been sent to backers indicating that more perks are on the way). Will you help us #SaveWardenclyffe? I just whipped up this LED tester tonight while at the lab. 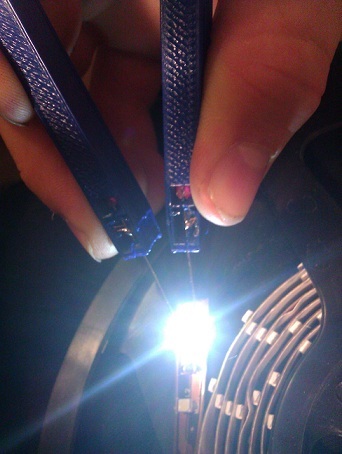 The two probes provide just the right power for a single normal LED. 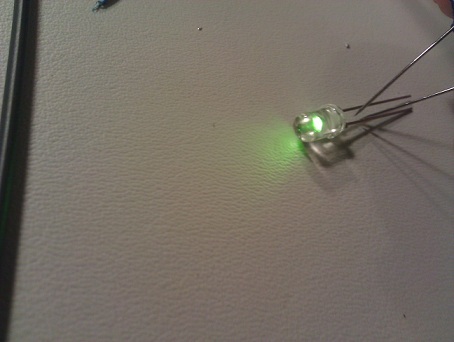 I built it because I need a way to test tiny surface mount LEDs. I plan on leaving it at the lab for everyone to use. Keep in mind though this is the alpha model, and while functional, it could do with some design improvements. I intend for the beta to include; an on/off switch, a built in power indicator LED, a variable resistor (so one can measure multiple LEDs at once) and some sort of case or cover for stowage of the pins so they won’t get bent. How would you rebuild the world from the ground up using opensource? Ran into this blogpost, its almost a year old so many of you have probably run into this, but its all about effectively. building farm and construction equipment out of interchangeable open source (Erector set like) parts. Check it out, and then come into Quelab to think in what ways can you change the world? Via Olaf Von Switchkicker’s Emporium of Killbox Creations. Terry Holt is a local Albuquerque maker who I met three weeks ago. He’s got an extensive background in engineering, but these days he’s working on (among other things) a portable structure he can tow behind his car and use to camp in relative comfort! His first version was designed out of foam insulation. He chose it as his material to prototype the design because it is light weight and easy to work, with the plan to eventually make the final design out of plywood. After several months of use he found the strengths and weaknesses in his design. 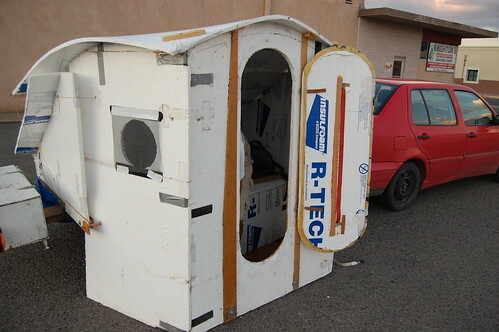 Ultimately he decided to stick with the light weight foam insulation instead of the plywood. This allows for it to be setup and taken down by himself in under 5 minutes and makes for a structure that is probably better insulated than my apartment! It’s a little rough looking as he has recycled a good bit of his last version into this one. I admit, with a quick coat of latex paint it might look a little less like a disposable cooler, but leaving it how it is does make it plain to see how it all works. He had just finished building it, and I have no doubt that with a little spare duct-tape and care this one will last him a while. 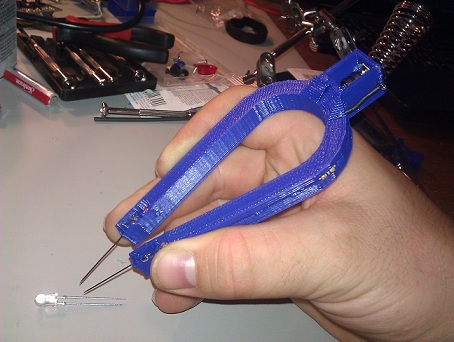 Terry recently demonstrated the structure for Quelab members. He brought it by not to gloat or show off (he’s really not that type), but as an example of the kinds of things he can do if members have ideas they want help making into a reality! Below is a link to pictures I took of Terry’s project.